Seniors and disabled people alike have trouble getting around. Thankfully, Swedish scientists say that they've created a special type of fabric that may one day help such people move around! The fabric, which incorporates robotic techniques, will provide people with mobility problems with muscle power, the scientists say. Here's everything you need to know about this fantastic new invention. 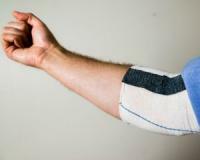 To make the clothing with textile muscles, Swedish scientists from Linkoping University in Sweden coated normal fabric with electro-active (meaning it responds to electricity) material. The electro-active material enabled the regular fabric to respond to low voltage power. When scientists applied low voltage electricity to the special fabric, it caused the electro-active material to react in a way that changes the fibres of fabric to increase in length. The scientists believe that this new technology could lead to the creation of textile muscles, which may one day help people with mobility issues. According to the study published in the journal Science Advances, researchers used this approach in a robotic device to lift up small weights. Can you help me with my pain? Your knees burn, finger crack and back throbs, yet modern medicine doesn’t have the slightest clue on how to solve it. They prescribe drugs that mask your aches, pains, arthritis and more – but that’s where it stops. They last a few short hours – and then you need more. “It’s our dream to create exoskeletons that are similar to items of clothing, such as running tights that you can wear under your normal clothes. Such devices could make it easier for older persons and those with impaired mobility to walk,” Jager added. It looks like disabled people shouldn’t lose hope on regaining their quality of life! Make sure you keep your eyes peeled for more on this new technology.